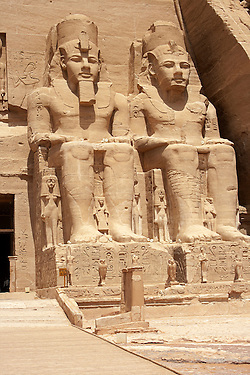 The Abu Simbel temples are two massive rock temples in Abu Simbel (أبو سمبل in Arabic), a small village in Nubia, southern Egypt, near the border with Sudan. They are situated on the western bank of Lake Nasser, about 230 km southwest of Aswan (about 300 km by road). 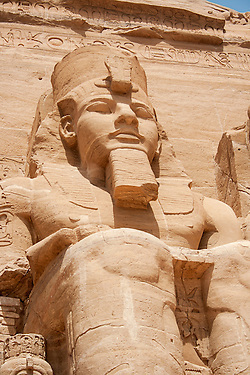 The complex is part of the UNESCO World Heritage Site known as the “Nubian Monuments” which run from Abu Simbel downriver to Philae (near Aswan). The twin temples were originally carved out of the mountainside during the reign of Pharaoh Ramesses II in the 13th century BC, as a lasting monument to himself and his queen Nefertari, to commemorate his victory at the Battle of Kadesh. However, the complex was relocated in its entirety in 1968, on an artificial hill made from a domed structure, high above the Aswan High Dam reservoir. 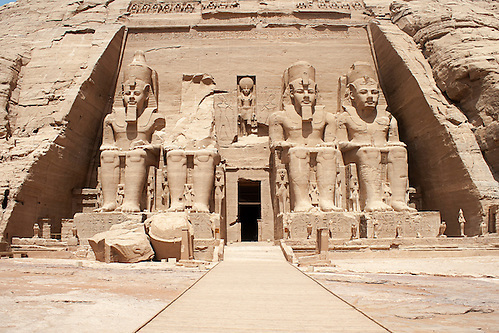 This entry was posted in Egypt and tagged abu simbel, egypt, lake nasser, numbia, pharoahs, ramesses, statues. Bookmark the permalink.